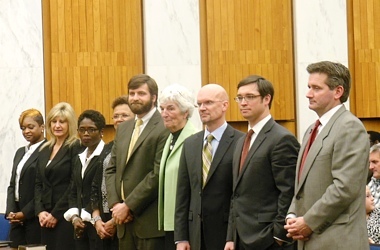 Last night City Council swore in three new members and elected a new president. It’s the biggest change in City Council in years. Today’s a big day for City Council, a bigger day for the three new members, and a really big day for one in particular. Officially this is the 2013 City Council Investiture Ceremony. It’s my first, and I can already see this is going to be different from any other Council meeting. There’s something in the air. It feels like a high school graduation with business suits instead of caps and gowns. There’s even a nicely printed program to commemorate the occasion. The place is full of parents, children, spouses and friends, and new faces. The real business today is the swearing in of the new Council and the election of a new Council President and Vice President. Kathy Graziano is stepping down and the man of the hour is Charles Samuels–who’s the heir apparent. It’s all over but the voting. His only challenger, Ellen Robertson, has withdrawn her bid. Any other day Council business would be called to order by the president. Today the investitures (the newly elected councilmembers) are sitting in the front row of the gallery and the honors are done by city clerk, Alvin Anderson. Members of the Franklin Military Academy Honor Guard march into the chamber with the flags of the United States, the Commonwealth of Virginia, and the City of Richmond. The pomp and circumstance continue with the National Anthem and the Pledge of Allegiance. Deputy City Clerk Jean Capel, then acknowledges guests in the audience including former Governor Gerald Baliles, former Council President Bill Pantele, and several members of the Richmond School Board. Pleasantries aside, the official business of the day begins. The results of the election are officially certified by a larger than life framed certificate, then one by one councilmembers step forward with family members to be sworn in. First up is Jon Baliles, followed by Charles Samuels and his wife Krista and son Henry. Each in his or her turn step up and recite the oath of office. I do solemnly swear that I will support the Constitution of the United States, and the Constitution of the State of Virginia, and that I will faithfully and impartially discharge and perform all the duties incumbent upon me as a member of Council, according to the best of my ability. So help me God. When finished, each receives a handshake from the city clerk, an enthusiastic round of applause, and then takes their seat as a newly minted councilmember. Mayor Jones takes the podium and gives the new Council his imprimatur, thanking Kathy Graziano and Ellen Robertson for their service during the last term and pledging to work with City Council to address the city’s challenges: better schools, infrastructure, and poverty. Now comes the moment that will steer the direction of City Council for the next two, most likely four years: the election of Council President. After a short, behind the scenes campaign, Charles Samuels has lined up the votes to win. Eager for his first act as a councilman, Jon Baliles moves to nominate Samuels for president…before the official roll call is taken. A rookie mistake, but everyone, including Baliles, laughs. Once again he repeats the motion, and quick as that, a vote is called and Samuel is unanimously elected. Everyone stands and applauds while he relocates himself to the president’s chair. In short, this all means that Samuels will be one of the most influential people in Richmond. As President, Samuels will be able to set the Council agenda, put key people on committees, and run Council meetings. With a united Council behind him, Samuels with have a large say in any initiatives Mayor Jones wants to pursue. Samuels, for his part, made a conciliatory, hopeful, and sometimes emotional acceptance speech thanking his deceased mother, his father (who was present), his law partners, and his staff for his success. He thanked the Mayor for his even-handed nature and pledged to work with him in the coming years. He also promised to reach out to the School Board and other regional governments. Specifically he mentioned lowering high water rates and a regional mass transit system as two of his goals. The devil of course will be in the details, but for the moment he’s in the catbird’s seat. This is the biggest change in City Council in years, and it remains to be seen how Samuels will use his power and how effective he will be. No doubt, he will make some rookie mistakes. Going forward he will be a lightning rod for Council actions. It’ll be interesting to see how he grows into the position and what alliances form among councilmembers. Right now there aren’t any. What alliances there were formed around the now-departed Marty Jewell and Bruce Tyler. Hilbert, if anybody, may challenge Samuels occasionally and maybe Robertson, but the new young crop of councilpeople look to be natural allies. For now at least, Samuels is running the show.